A step-by-step guide to find out the game horizontal (X) and vertical (Y) dead zones. 1. Connect your Titan One device on the console, the PCPRO port on your computer and launch the game you want find out the deadzone. 2. Open the MaxAim DI mouse settings window and configure it as show in the picture above. 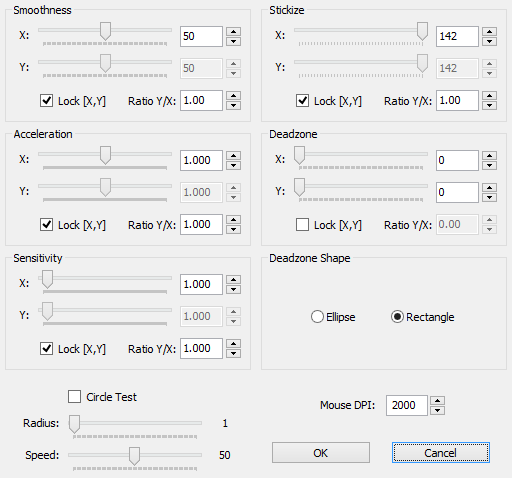 The mouse DPI parameter should be set to match the mouse in use. Enable the Circle Test by clicking on the correspondent checkbox. Increase the X parameter until notice a in-game movement on the X axis (horizontal). Take note of the value and set it back to 0. Increase the Y parameter until notice a in-game movement on the Y axis (vertical). Return the X parameter to the value you took note in step 3 and this configuration is done. The next step is choose the best deadzone shape for the game.